One thing I love about riding my bike vehicularly is seeing the world at a little slower pace. My commuting pals Daniel and Ellen are far better at taking in the details than am I, pointing out to me a lot of the world that I zip by, even on my bike. Perhaps my mind wanders too much. But I enjoy seeing the seasons change a little more clearly, catching a whiff of coffee roasting smoke from Counter Culture or Muddy Dog, and especially seeing and interacting with people I come across on my various trips. Last night I was riding home on a heavily trafficked state route when I noticed what looked like some kids playing stickball. I looked a little closer and realized... those aren't kids... and that's not stickball! 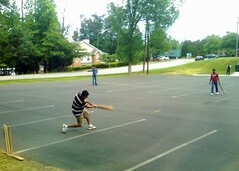 I had come across a game of pick-up cricket. Right there behind the Lutheran church! While my understanding of cricket is vague, I actually dig watching it, so I pulled over for a few minutes and watched.